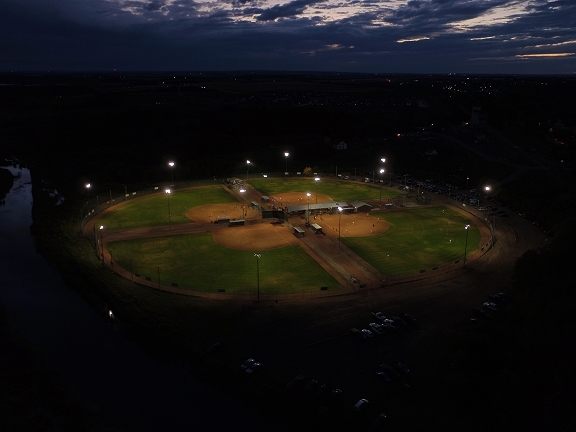 On a hot August night, when four busy slowpitch fields are bathed in artificial light, the parking lot is jammed and the concession stand is dishing out beer and burgers, the Meadowview Diamonds shine like a river valley jewel. 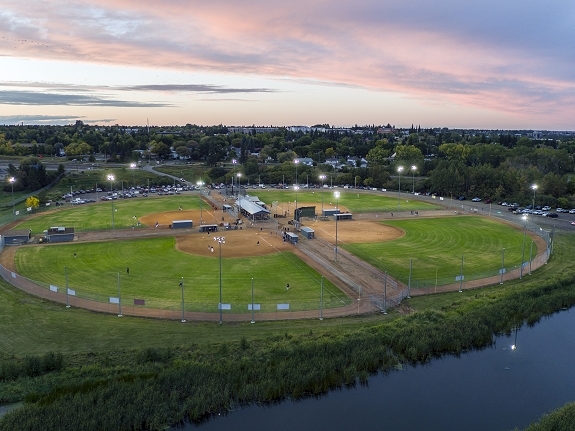 Proud home to the St. Albert Men’s Slow-Pitch Association, the facility at 1 Meadowview Drive — just a hard line drive across the mighty Sturgeon River from both Lions and Millennium Parks — really seems to get better with age. About four decades ago, before home run balls and on-field chatter filled the air from May through September, the place was a dump. Quite literally. The property was the site of a City of St. Albert landfill until it was remediated and turned over to proponents of fastball in 1979 and slowpitch in about 1982. SAMSPA’s latest 20-year lease, consummated with the City for the princely sum of $1, expires at the end of October 2017. There will be more to come. The league is stronger, the ball park in much better shape now than when that deal and the one before it was signed. The credit for SAMSPA’s longevity and the facility’s dramatic, consistent improvements surely has to go to those men who have grown the organization from an eight-team novelty in 1980 to a respected 55-team enterprise, among the largest men’s leagues in the country. Men like founding president Frank Vettergreen (1980-82 and 1984), current president Erv Krawchuk (2013-17), longest-serving president Malcolm Parker (1997-2010), and the eight other men who have led the association: the late Hec Gervais (1983), Dan Rouault (1985-87), Brian Dickson (1988), Ed Kells (1989), Jim Walsh (1990-92), Brian Message (1993-94) Tony Durocher (1995-96) and Mike Dalrymple (2011-12). They were ably assisted by a host of vice-presidents and directors far too numerous to mention here. Along with the thousands of other players who have populated the rosters of teams in the open, plus-40, plus-50 and plus-60 divisions, those men wrote the SAMSPA story — one of sportsmanship and competition, volunteerism, growth and innovation, pride in the community and longevity. It’s a story that begins in the late 1970s. Vettergreen said slowpitch wasn’t even a recreational option for anybody north of Wetaskiwin back then. The game was all the rage in Calgary and southern Alberta, but baseball and fastball were the preferred pursuits up here. The idea took hold and slowpitch was added to the Games programme for the first time. The City therefore needed a venue and poured some of its $450,000 facilities upgrading budget into Meadowview, to get its two diamonds into ship shape. Vettergreen was the slowpitch chairman for the Games, and was responsible for organizing open-age tourneys for men and women, on a budget of $950. The equipment list featured 12 bases, three home plates, three pitching rubbers, eight bags of lime and six dozen slowpitch balls. Eight men’s teams and seven women’s teams entered, after one district failed to mount a women’s squad. The tournaments were modified double-knockout, featuring seven inning games. Taber took the women’s championship, the Pincher Creek Woodchucks won the men’s side. About 3,000 fans watched the action over four rain-soaked days in early August 1979. Well, on the men’s side, anyway. “The ladies kept playing fast pitch,” he said. Out of those Games came the formation of SAMSPA, which started with eight teams in a single, open division in 1980. The St. Albert Gazette took notice of the fledgling league that spring. “The eight-team league, in its first year of operation, is battling for the Carling O’Keefe Award and the right to brag to their friends what great ball players they might have been if only big league scouts had noticed them,” said a piece in the Gazette. The Alberta 75’s were the class of the league that year, going 16-1 in regular season play, before marching through the playoffs and defeating Rene’s Auto Oilers in the ‘A’ Final, to claim the Carling O’Keefe Award. The Denim Den beat the Standard General Whirlwinds in the ‘B’ Final. Also playing that first year were the Gazette Slopokes, Villeneuve, Belcourt Spurs and the Plumbing Made Easy Riders. Most of the games weren’t played at Meadowview, which was still largely the domain of fastball teams. For the first couple of years, SAMSPA teams played mostly on school fields in St. Albert. Parker said Father Jan School on Mission Avenue was used most often as home base. Even so, Vettergreen said SAMSPA membership grew by two teams per year for the longest time. And because slowpitch kept growing in popularity and funnelling players away from fastball, it made sense for SAMSPA to move lock, stock and bat barrels into Meadowview. It was still a modest facility back then, just the two diamonds, no concession, no batting cages. But slowpitch was here to stay and Meadowview offered the SAMSPA a permanent home with plenty of room for improvements. In the mid-1980s when Rouault was president, SAMSPA didn’t even have a liquor licence. The boys brought their own beverages and drank on the tailgate after games. Rouault remembers having an entire pallet of beer in his garage at the beginning of every season. “This may sound weird but back then, every year I would go talk to the RCMP. As long as nobody complained, we could drink down there, and (the RCMP) would just leave us alone. It was like that for years and years. The conversion from bring-your-own beer to the current setup came in about 1998 and wasn’t without challenges. “It was a hard switch-over when we got the liquor licence because people were used to drinking on the tailgate,” said Rouault. Opponents of the idea were convinced to go along when league officials ensured everyone the beer vending part of the business would be run as a non-profit enterprise, and teams would get percentage rebates. Decades later, beer is still just $3 per can at the concession and teams are reimbursed a percentage of their previous year’s bar tab prior to each season, money that is put toward league fees. It was a rather logical step in the right direction. There have been plenty of others, including the necessary capital improvements. Parker also said the current washroom facility was built in 2008 and connected to the City sewer system. The current generator, which billows black smoke and powers the field lighting every night, was a gift facilitated by one of SAMSPA’s members, just like the unit that preceded it. Membership connections run deep, so too the volunteer and community spirit. Each September, SAMSPA donates use of the facility to the Batting Against Breast Cancer charity slowpitch tournament. Founded at Meadowview, that event and the tourneys it spawned in Winnipeg and Calgary have raised in excess of $3.4 million for cancer research. SAMSPA members also volunteer to act as umpires during the tournament. Krawchuk, who is stepping down at the end of 2017, has been at the post since 2013 and is proud of the fact that there have been some radical, positive changes made during his tenure. Indeed. In 2017 there were eight teams in the plus-50 division, which means there is room for a maximum of 200 players. Some of them are surely guys who didn’t feel comfortable in the plus-40 division any longer and weren’t quite old enough for plus-60 play, and might well have dropped out of the game were it not for the new division. He said the executive also negotiated a “proper contract” with the umpires, which provides stability for both SAMSPA and the men and women behind the plate. Krawchuk said he is also proud of the “refurbishing” that has been performed on the facility. The netting on the fences has helped save windshields in the parking lot and contain some of the home run balls that used to bob along the waves of the mighty Sturgeon River, which flows west past the outfield fences of diamonds three and four. The proliferation of long bombs was also reduced by the introduction in 2015 of limited flight balls. Krawchuk said the most pressing order of business for the next president and executive will be the negotiation of a new lease on Meadowview with the City of St. Albert. The current, 20-year pact expires Oct. 31, 2017, but Krawchuk and the City have agreed to extend terms of the deal for another year. That takes the municipal election out of the equation. Whoever takes over from Krawchuk inherits a very healthy league. There are 55 teams in SAMSPA, making it the second largest men’s slow pitch league in Canada. The Beaches Men’s League, which was founded in Toronto in 1921 and switched from fastball to slowpitch in 2013, is the biggest in the country with 60 teams. SAMSPA reached a peak of 56 teams in 2015. The league’s popularity doesn’t seem to be waning. “I think it’s because it’s a good balance between competitive and fun,” said Krawchuk, who added that he has already heard from three more teams that want to join SAMSPA in 2018. They might be accommodated, but only if teams agree to cut their current 28-game schedules down to perhaps 25. All these decades later, Rouault isn’t the least bit surprised that SAMSPA is still going strong. There has been talk that the City of St. Albert has plans to build and open a new facility, with either eight or 12 diamonds, somewhere in Sturgeon County in the near future. SAMSPA would certainly seem to be a highly coveted tenant, able to deliver more than 50 teams and a highly responsible operation. But Meadowview Diamonds has been home for more than 35 years and it seems unlikely that the gentlemen of SAMSPA would want to leave. “We’re pretty comfortable down there,” said Krawchuk.